Rogue Hippopotamus (330/365) – Annoyingly Boring? Cookie stealing hippo spotted in my kitchen. Beware. Oh man – don’t you hate when that happens? I mean, what can you do? They are endangered I think aren’t they? So you can’t put out traps or anything. Bummer. HA! I love it. The person in the background doesn’t look too concerned, tho. Rupe doesn’t believe Terminix handles that kind of thing …..
That would freak me out a bit. that is one dang big cookie. Funnier title: “Hungry, Hungry Hippo”. That is pretty funny. I was looking at this when my four year old glanced at the screen. 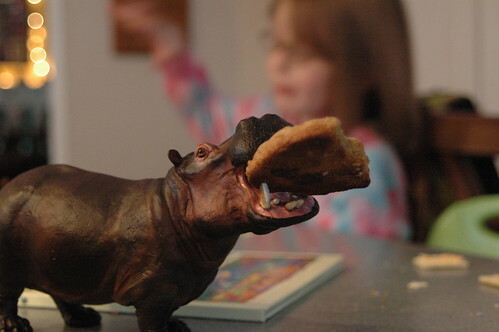 She was trying to determine if the cookie was huge or the hippo small. No explanation of my own was good enough. Looks kinda like my dog when she steals a waffle off the table! That is cute as all get out!